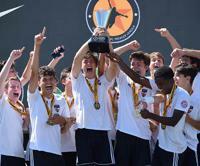 AURORA, Colo. | The inaugural Elite National Premier League (ENPL) season came to a dramatic close Saturday during the 2018 ENPL National Finals at Aurora Sports Park, awarding four clubs with four national titles in the 14-U through 17-U boys age groups. It symbolized the end of the first year of a collaboration between US Club Soccer and the Elite Clubs National League (ECNL), which has effectively elevated the youth boys soccer landscape and provided top competition, development and identification opportunities to 16 qualifying NPLs and Boys ECNL Conferences throughout the country. In total, 16 teams competed at the 2018 ENPL National Finals in Colorado. The diverse group of national semifinalists advanced to this event by securing top two finishes in the ENPL Eastern and Western Playoffs, held two weeks ago in Massachusetts and San Diego, respectively. While the 14-U through 17-U age groups played in a challenging two-stage postseason pathway, the 19-U ENPL National Finals champion – Ohio Premier SC – was determined after a single-stage final held alongside the postseason events in Massachusetts. On Friday, July 13, ENPL National Finals participants played the semifinal round in what consisted of eight tightly contested games. Six of those games were decided by two goals or fewer. The ENPL National Finals provided an ideal environment for college coaches to scout for potential additions to their programs. College coaches dotted the fields at Aurora Sports Park, especially at the 16-U and 17-U matches. The Boys ECNL Texas Conference was the only ENPL qualifying competition to earn more than one title (Classics Elite in 17-U and TSC Hurricane in 14-U). The Boys ECNL Southwest Conference had three participating teams at the ENPL National Finals, and the NEP – NPL Division had two, including one that went on to win the 16-U bracket (GPS MA Elite). Additionally, the EDP – NPL Division, Florida NPL, NorCal NPL, NPL West, NYCSL – NPL Division, USC – NPL Division and the Northeast and Southeast Conferences of the Boys ECNL were all represented. For a complete map of the ENPL qualifying competitions, please visit elitenationalpremierleague.com. The ENPL National Finals was held alongside the 2018 Girls NPL Finals, which takes place July 12-16 at Aurora Sports Park. For ongoing coverage of the 13-U through 19-U girls teams that are also pursuing national titles, please visit nationalpremierleagues.com.